The previous alert level and color code were raised three years ago, in response to an increasing trend in earthquakes and ground deformation. 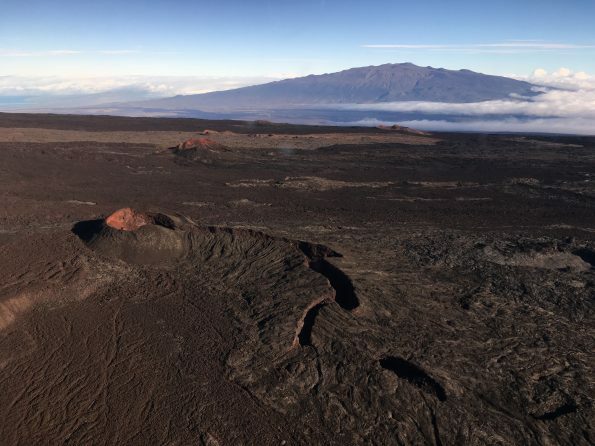 Beginning in 2013, earthquakes became more frequent at Mauna Loa and were clustered mostly in the uppermost Southwest Rift Zone, summit area and west flank. By mid-2014, continuously recording GPS stations and satellite interferometry (InSAR) were showing outward motion of the volcano–an indication that magma was filling the shallow reservoirs beneath the caldera and upper Southwest Rift Zone. For the next several years, HVO seismic stations continued to record variable, but overall elevated, rates of shallow, small-magnitude earthquakes beneath Mauna Loa’s summit, upper Southwest Rift Zone, and west flank. During that same time period, ground deformation was consistent with input of magma into the volcano’s shallow magma storage system. When it became clear that the heightened level of activity was persisting, HVO raised the alert level and color code of Mauna Loa to ADVISORY/YELLOW in September 2015. It was noted at the time that the increase in alert level did not mean that an eruption was imminent or that progression to an eruption was certain. Indeed, this episode of unrest lasted several years without progressing to an eruption, similar to a period of unrest from 2004 to 2009. Starting in late 2017 and continuing to present, seismicity and deformation rates have declined to levels observed before 2014. Given the months-long decrease in activity, HVO lowered Mauna Loa from ADVISORY/YELLOW to NORMAL/GREEN. Declaring the end of unrest is often difficult. Activity can wax and wane at volcanoes and observatories make an effort not to switch between advisory levels without careful consideration of data trends. Periods of unrest that do not lead to an eruption are fairly common at Mauna Loa. Between 2004 and 2009, for example, the volcano went through a period of increased activity that eventually slowed. Mauna Loa may again start to show signs of unrest, at which point HVO may raise the alert and color code levels again. We expect that future eruptions at Mauna Loa will be preceded by increases in seismicity and deformation as magma makes its way to the surface to erupt. Changes in technology and experience gained in monitoring Kīlauea have resulted in dramatic improvements in the monitoring network since the most recent eruption of Mauna Loa in 1984. These include enhanced seismic instrumentation, a dense GPS network, and the use of space-based techniques such as InSAR. This allows HVO to track the small signs of unrest in ways not possible in the past. If anything were to happen at Mauna Loa, HVO scientists would know as soon as possible, through daily checks of geophysical data and automated alarms, despite having their current focus mainly on the eruptions at Kīlauea. Many people have wondered what affect the current activity at Kīlauea has had on neighboring Mauna Loa. The M6.9 earthquake on May 4, 2018, was caused by slip of the south flank of Kīlauea toward the ocean. This large earthquake pulled the ground surface all over the island of Hawaii, including Mauna Loa, slightly to the southeast, with areas closest to the earthquake epicenter moving the most. Further, the rapid deflation of magma reservoirs beneath Kīlauea’s summit is currently pulling the ground towards that area and this slow motion is evident at GPS stations on Mauna Loa, especially on its southeast flank. None of the activity on Kīlauea has had any discernible effect on Mauna Loa’s magmatic system. Given Mauna Loa’s active past, residents should still be prepared for when Mauna Loa does erupt next. Information for readying our island community for whatever Mauna Loa has in store for us can be found at volcanoes.usgs.gov/vhp/prepare….